Walking Bear Comes Home: The life and work of Chuck Jonkel premieres April 20th at the Roxy Theater in Missoula. 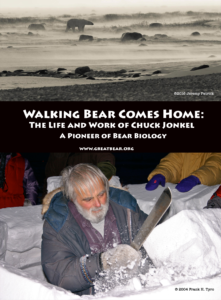 Join us for the world premiere screening of Walking Bear Comes Home: The life and work of Chuck Jonkel at the 40th International Wildlife Film Festival, Thursday, April 20th, 2017 at 5:00 PM at the Roxy Theater in Missoula. Come early to honor Chuck at 4:00 with a reception, poetry reading by Vic Charlo, and unveiling of a permanent memorial inside the theater. After the film, we’ll celebrate the release of Great Bear Cider, a hard cider made with fruit gleaned from our Bears & Apples Program, at Western Cider, 501 N California St. from 7:00-9:00 PM. Western Cider generously donates 10% of the proceeds to the Great Bear Foundation. After conducting the first capture-and-handling studies on black bears in Montana, Chuck Jonkel explored the Canadian Arctic pioneering the field of polar bear biology. Walking Bear Comes Home examines Jonkel’s contributions to wildlife biology, conservation, and community through interviews and archival footage. Walking Bear Comes Home: The life and work of Chuck Jonkel was sponsored by Humanities Montana, Cinnabar Foundation, Salish Kootenai College Media, KSKC Public-TV, Caribou Crossing, and private donations. DVDs will be available at the screening, or pre-order here.